from Charles Poliquin B.Sc, M. Sc. This is a program you can trust . Combine Will’s nutrition and supplement information with my training tips and advice, and success is virtually guaranteed. It would take pages to do complete justice to reviewing Brink’s Bodybuilding Revealed, because it is such a monumental piece of work. I can’t imagine the man-hours that went into the creation of this resource let alone the research that had to be done. In my eyes, even more important is the honesty and objectivity of the reviews and recommendations, which is very important in the shady, biased and confusing bodybuilding marketplace. In particular, Will’s method of looking at “what the science says” AND “what the real world” says is the best possible approach to making informed decisions about products or programs. Overall, two very big enthusiastic thumbs up! Will has helped thousands build muscle, lose fat, and transform their bodies. With B.B.R, Will provides one of the most comprehensive resources available today. The e-book gets into specifics regarding exactly what and how to eat in order to gain lean muscle mass and burn fat. Don’t let the hard-core look fool you . As I’ve said a thousand times, the principles that work to gain fifty pounds of muscle are the ones YOU need to apply to gain five. The interaction with other trainees, Will and his expert team, is what makes this deal a steal…that and it’s free for a year. (I think Will is bonkers for giving this much content away for free…and I’m darn sure that won’t last…but hey, that’s his business. )BBR is a must-have — no questions asked. The supplements section alone will save you five, ten, even a hundred times what you pay for the e-book. Trust me — most of the stuff people take is worthless, but Will goes into why, and the science behind it, plus what really does work. Will’s “no BS” approach stands in stark contrast to the hype you see elsewhere on the internet, where the “information” is designed to sell supplements and additional products. Thanks to the BBR e-book and forum, I’m in the best shape of my life. from Hugo Rivera CFT, SPN, BSCE. This industry is riddled with misinformation, most people are left to figure out which of the information is valid and which is not. With Will Brinks program however, valuable time and money is saved as Will covers every aspect of the bodybuilding equation, including the confusing subjects of muscle building nutrition, training, supplementation and cardiovascular exercise. As you can expect from Will, precise formulas are provided to help you calculate your diet as well as solid practical training routines and nobody has the level of knowledge on supplements that Will does. Nothing is left to interpretation so once you are done reading the book, you will know exactly what needs to be done. The free access to the Inner Ring is really where this system just plain over delivers, access to Will himself, to other BBR members, that’s priceless. “There are few trustworthy individuals in this industry, Will is one of them. This is quite simply a must have resource. I gave Will Brink the name of “the secret weapon” and it stuck. His knowledge of taining, diet and supplementation was invaluable to my assault on the Nationals and USA. Any number of books on the topic of weight loss bedazzle with theory, just as numerous weight loss products beguile with promises to deliver magical results. Fortunately, Will Brink’s compact and timely volume clears out the confusion and the hype. Because Brink not only is an established author on health and fitness topics, but himself also a personal trainer, he knows what works and what doesn’t. His information would be valuable if all it contained were the feedback from individuals who have already tried all the fad diets and the magic potions. Bodybuilding Revealed is worth the investment just for Will’s extensive Nutrition and Supplementation segments alone.Will is an industry icon who has written many amazing articles. I was first introduced to his nutrition and supplementation ideas back in 2000. I was still eating and training the same way I had been since the late 80′s. Will changed the way I think about fat, forever! Will helped me to revamp my program so my body would turn into a fat burning furnace. Will keeps up with the times and his attention to detail and extensive research will leave no rock unturned when you go to incorporate all of his information into a new program. I’m always very skeptical when it comes to information about supplements. I have been working with athletes for years, and now I know what works in the real world and what doesn’t, thanks to Will. “The problem is: Most of the information available in print today is much too uncritical when it comes to useful information for the hard-training athlete. “Will’s book is one of the few exceptions. In a straight forward and honest manner, he describes nearly all the fat loss supplements available today in an easy to read format. “Will’s book gives the reader basic background information on every supplement and judges its effectiveness not just by medical studies, but as well by his own experiences with athletes and others. “A person who knows his stuff, has a scientific background, and plenty of experience working with people for over a decade, is hard to find today. Will is one of these exceptions, and if you are looking for unbiased information about fat loss supplements without any marketing hype to decide for yourself what to buy, this is definitely for you. Will Brink is one of the most knowledgable writers and trainers in bodybuilding today. He uses science, experience and common sence in his approach to gaining muscle. Just a quick email to say what an excellent job you have done with this book. 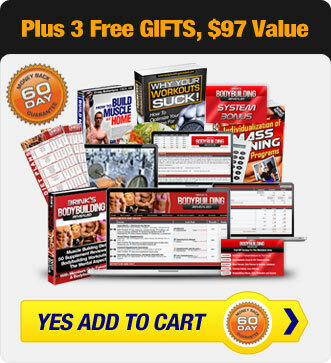 I have trained bodybuilders and other athletes for years, and have literally spent a lifetime in bodybuilding and never seen a better guide to muscle building nutrition. Should be in every bodybuilders library of books. from Dr. Kevin Pezzi M.D. Will Brink’s information is a valuable guide for anyone who wishes to lose weight without wasting a lot of money or time trying over-hyped but ineffective diet supplements. Brink clearly explains what works and what doesn’t and why. Unlike most authors who simply spout research findings or anecdotal reports. Brink melds both scientific evidence and real-world experience to give you an unparalleled grasp of this subject that is certain to help you in your quest to build a better body, his fat loss diet is one of the soundest and result producing I’ve seen. If you are into any sort of strength/weight training, are looking to build some serious muscle, and/or you routinely spend money on supplements that build muscle, you can’t go wrong with Will’s Bodybuilding Revealed . It’s a great product and a great value. I have no reservations about recommending it. Will has been a major influence in my bodybuilding nutrition and supplement usage for as long as I can remember. I can’t afford to waste time on worthless over hyped information. Will is the real deal, having access to him is like having everything you need to know to get into shape at your fingertips. He’s always delivered quality information I can count on and he’s is one of only a tiny handful of people whose opinion on nutrition the experts and pro’s genuinely respect. If your trying to get in shape, I don’t think anyone could go wrong with Will’s advice. Few disciplines of human health and wellness are plagued with as much unscientific conjecture and over hyped marketing as that of nutrition, particularly nutrition for fat loss. Fat Loss Revealed is centered on presenting effective, evidence-based, hype-free dietary and exercise principles in a user-friendly manner. Fat Loss Revealed is a must for anyone looking to achieve a leaner, stronger, and healthier body.” I use the FLR system myself and can recommend it. As the author of 2 e-books and an expert in beginning bodybuilding, Will Brink’s Bodybuilding Revealed System is the one product I wish I had around 16 years ago! I’am convinced anyone who picks up a copy of Bodybuilding Revealed and actually reads it cover to cover, will save themselves years of trial and error and avoid the common pitfalls that all bodybuilders seem to endure. I’m not kidding when I say that I “virtually” gained 10 lbs of muscle in the 3 hours it took me to read through the system. I even discovered some post-workout secrets that I’m convinced have already put a pound of muscle on me in just 7 days. It’s that good. I’m definitely impressed! I learned so much from Will about the correct muscle building diet and bodybuilding supplements, I wouldn’t be this lean and muscular without him. His knowledge is unparalleled. I strongly suggest you read what Will has to say – It’s a must for any man or woman. Will Brink’s information on weight loss supplements and diet is a terrific tool with which to help the lay reader navigate the often conflicting and confusing information behind weight loss supplements. The weight loss industry is replete with misinformation and outright deception in advertising but Will Brink’s info analyzes the data behind weight loss supplements and supplements in a straightforward and easy-to-read manner that should be invaluable to the reader. You’ll get “the real deal” behind the marketing hype to determine which supplements have the scientific data to back up their claims! Don’t fall for the hype- let Mr. Brink’s give you the information you need to make informed decisions about weight loss supplements and nutriceuticals! from Dr. Paul Afek Physician - Arizona USA. I have gotten lots of valuable information from the Bodybuilding Revealed system and the Inner Circle. There is so much information and misinformation out there, and Will’s information takes a rational and reasonable approach to it all. As a Doctor I am extremely picky on where and who I take advice from but this is information that can be trusted. from Milos Sarcev - Temecula, CA. I have followed Will’s work for over a decade and I highly recommend Bodybuilding Revealed to people. I first met Will many years ago in Niagara Falls. We started talking about exercise physiology and performance nutrition. After about an hour of his monolog I knew that instead of purchasing every bodybuilding piece of research in the world all I needed to remember was his phone number, Will is the most honest and down to earth guru’s in the industry, I trust him implicitly, the changes I was able to make to my physique with his advice are simply amazing.